For the most part, the book series I have read progress the story from one book to another. I get that there are some series with the same character in different predicaments for each book, but jumping from one character to another in each different book is an interesting tactic. Of course, I’m somewhat guilty of this, as The Fluxion Trilogy focuses on different characters for each book. As far as I can tell, The Clockwork Century series also does this, even if the connections between the characters are flimsy at best. Even so, the plot seemed to take a step backward from Boneshaker to Dreadnought. One of my qualms with Boneshaker was that there wasn’t a lot of world-building that established what this alternate-reality Seattle was like in the scheme of the broader United States. Dreadnought solves this problem by giving the main character an opportunity to travel across the country, thus establishing some of the world-building in the process. In fact, there were a few points where I wondered if I had picked up the first book in the series, only to confirm that Dreadnought was the second book. Unfortunately, I thought the plot of Boneshaker was a little more believable since the cross-country trek in Dreadnought seemed like an obvious ploy by the author to introduce the world to the reader. I certainly appreciated the thinking that went into the consequences of a decades-long Civil War, but I still think the “zombie” angle of this series seems out of place. I get that steampunk is the combination of some more modern technologies in a Victorian era, but the zombie genre seems so modern that combining the two never really gelled for me. Plus, through the plots of two books, I feel like I’m no closer to understanding where the gas that creates the zombies originates, or if there’s even an endgame to the zombie situation. 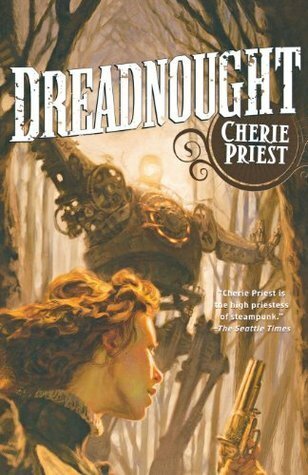 A book that should have come first in the series, I give Dreadnought 3.5 stars out of 5.